Beauty experts across the globe agree that facial exercises are superb for tightening and firming skin, while promoting blood flow so that your skin boasts that healthy, youthful glow we all want. Facercise is touted as the premier, world class system that has dominated the marketplace since its inception over 40 years ago. If you haven’t tried it, then you must hear what renowned doctors and plastic surgeons have to say about exercising the 57 synergistic facial muscles with this incredible set of facial exercises. Plastic and cosmetic surgeon Dr. Francis Palmer promotes the effectiveness of facial exercises in his 2009 book, “What’s Your Number? The Palmer Code.” He states that facial exercises increase elasticity and firmness of the skin and can tone up the muscles in the eye area, cheeks and neck. On his popular daytime show, Dr. Oz states that you can get a facelift without going under the knife and achieve clinical results simply by performing at-home treatments for laugh lines, saggy cheeks and wrinkles. 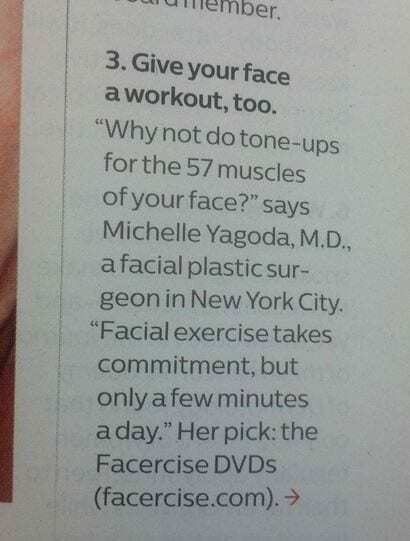 Click through to learn more about the results of our extremely effective proprietary system of facial exercises known as Facercise. We also offer an equally results-oriented DVD for the body featuring our knuckle-style massage that diminishes fat safely—our No Lipo Lipo DVD.